Monday: 9:30 spinning class at the Oval only to find Tex was stuck in traffic so spent an Hour in the Gym waiting for the 10:30 class only to find that cancelled too. Website has been down all weekend along with the email, it’s been a week or so over 5 years since all this started off and the stats do take time to digest. The enforced break did mean I’ve got to grips with my menu issue that’s been holding things up. Due to the traffic I’m turning on Likes and Ratings on comments and posts so readers can get more involved without having to comment. You don’t need approval for comments after the first one. Links are going to be updated, dead links removed and new ones added. You don’t know what you’ve got to you loose it. LBS links to be added. Tuesday: Took the hammer to the broken Colnago Carbitubo but it’s still not playing ball. Put it away again as I wasn’t getting anywhere and don’t want to cause further damage. The Mk 2 is probably a size too big for me. Wednesday: Blog updated, had to repost the before picture. Still not got around to sending the 705 back to Garmin. Featured image set to the dog at Gt Budworth ICF so still playing around with things. Thursday: Work. Been following a few links and blogs, a few are failing so need to be removed. Saturday: 705 went back to Garmin for exchange. Going out to test ride some more bikes at Vita Cycles, it’s a hard life. This is the second Saturday I’ve been out riding top end bikes, last Saturday it was Sabbath titanium bikes which felt really good. 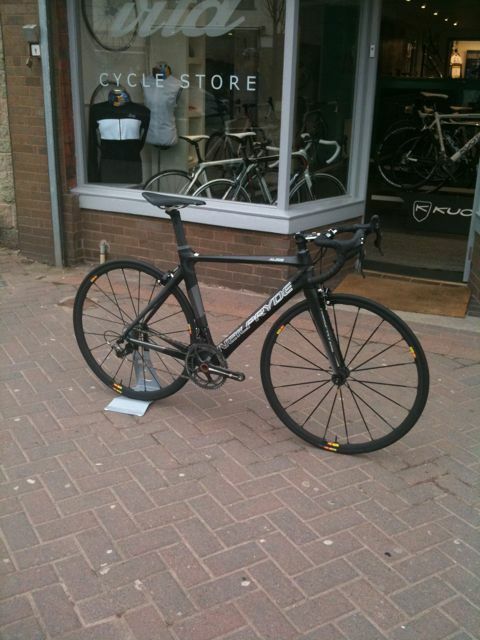 This Saturday it was Neil Pryde carbon fibre bikes. To be honest I had never heard of them only knowing about them from Vita and a tweet on the twitter feed. Things didn’t start too well as the Toy slid down the wall in the shop looking like it had scraped all the paintwork on the top tube. Luckily it all polished off when I returned home. I ended up going out on the Diablo which is a pure race bike and it shows. It comes with a Dura-Ace groupset and Mavic Ksyrium SL wheels, in short there is not much better out there. I went out with 3 other handy lads on a loop to Newton across to the bottom of Column Drive back up Mongomery Hill via the Irby Mill and back to the shop. The first thing that strikes you is the stiffness coupled with the lightness of the thing, it’s right on the UCI weight limit. You notice the bike accelerate forward as you stomp on the pedals. The headstock is a massive affair and is as solid as it looks. My now old Trek is puny in comparison. Got dropped on Mongomery Hill but coming out of the saddle you knew it was you and not the bike. Shimano’s latest groupsets feel great with the flat transition from bar to hood feeling really comfortable, shifts from the hoods are faultless and really light. This was the first time I’ve ridden Dura-Ace and I like it a lot. Back at the shop the matt-black Alize is being assembled with matt being the new black. It is paired with a development pair of matt-black Mavics with what I think is a ceramic braking surface. The big problem is going to be keeping it clean, anyway there are six mamils outside on the pavement when a woman stops and says her brother in law would be out here drooling along with us if he’d known. 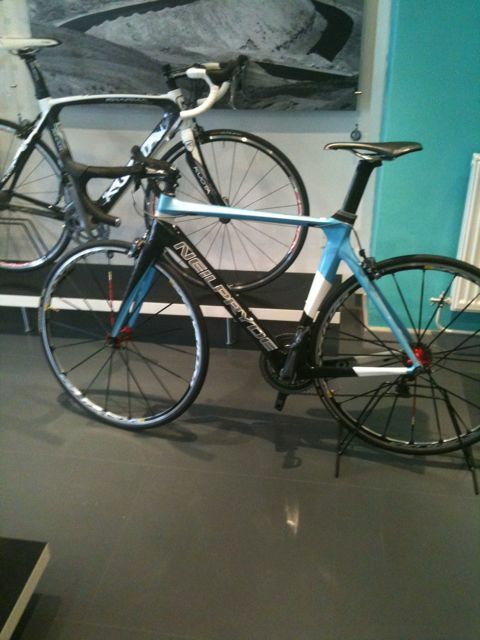 The second bike I took out was the Alize above with a very similar blue to the Team Sky colour. Cycling Plus had managed to chip the paint on one of the demo bikes which will be hard to match as it looks like a pearl finish. I followed the route I rode last week with Phil and Shaun opting not to go out with the quick group who where coming back up the hill towards the shop as I was heading out to Arrow Park. It had started to rain too and it could have been an expensive pile up. Rode back with another group including Barry or at least tried to as I was off the back from the start and only caught them up at the lights in Heswall. It was left at Gayton roundabout heading towards Barnston dip. It was a fast pace and Barry promptly blew up, I had to bridge the gap to slow the other two up. Peeled off at Station Road and headed home. Sunday: No ride but spent the day in Southport. Glad it’s all up and running again. Looking forward to more posts! Love that Trek, not sure about the brown colour though. It’s a Trek Portland, the brown does match the leather looking seat and bar tape. I had thought of ditching WordPress as the Blogger sites look so much better but the stats package say I get about 300 visits a day for all the previous stuff and I don’t want to lose the Google rankings. Starting to enjoy it all again. 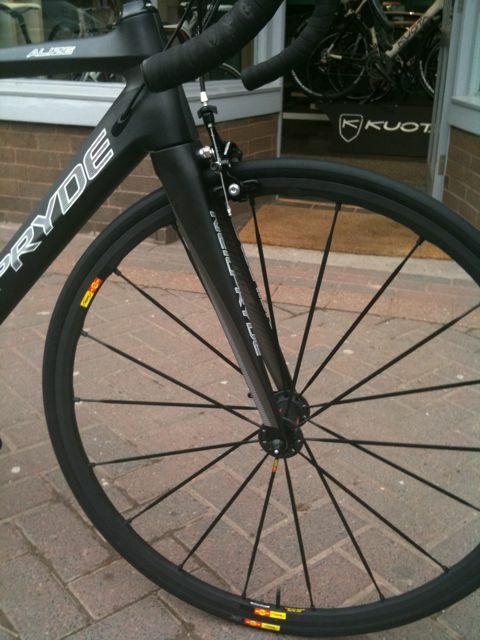 What is the report on the Neil Pryde bikes that you tested?? Or are you going to do an article on it. Could do, between the two weeks I’ve taken out £9000 worth of bikes. The Diablo I rode was nothing short of amazing, super stiff and a pure racing bike. Didn’t get to ride the matt black one but it looks amazing. OK a report it is. Shaun here from the Sabbath ride. Great site wth plenty of information rather than my own ramblings. I have to agree on the bikes. I see them as a toolkit with different ones for different events. I used Vita’s orbea for a very hilly 60 sportive yesterday and it was perfect (which is good news as my own should be in any day now. The diablo from Neil Pryde though would be ideal for short races with lots of sprints such as the Oulton Park event (which is on again this year) I also loved the sabbath for a quality, fast, lightweight bike. I think it will be the diablo in matt black though to complement the stable of six other bikes all with their own use. there is a lot of content on the site now that drives traffic and content is king. I’ve got to get my form back and weight back down to be in with any chance of Oulton Park. If I can split the rides up I’ll post them too. Ros, sorry to be the bearer of bad news but it is a different Barry, Barry from Vita. To be fair it’s a manic pace because none of the bikes have a speedo fitted so everyone is riding on feel. Some Very handy lads turned up for the first ride and I can’t fault the bikes, they were brilliant, stunning in fact. I haven’t mentioned the food or cakes but they were top class too.